IT has become an impossible task to examine the Borussia Dortmund of this decade outside the shadow of Jürgen Klopp. In 2015, when the bespectacled German left Dortmund, European media pored over his departure, suggesting that he had become bigger than the club. His successor, a young Thomas Tuchel, was subjected to comparisons, until he would label himself the ‘anti-Klopp’; ultimately, though, never matching Klopp’s legacy. Last weekend’s Bundesliga game against Bayern Munich was the biggest test so far for new manager Lucien Favre, and if any doubters remained despite Dortmund’s seemingly immediate progress, the 3-2 win must have convinced them. Looking back at recent history, Tuchel was bright but could not match the spark, or gain the adoration, of his predecessor Klopp. Neither could Peter Bosz or Stöger, who both oversaw mediocre performances during the 2017-18 season. The managerial seat at the Westfalenstadion is a hot one, a poisoned chalice in some regards, caught between the decisions of utilitarian CEO ‘Aki’ Watzke and the impassioned demands of the Yellow Wall. In steps Lucien Favre. Like Klopp and Tuchel, Favre has had success with other clubs in the Bundesliga, initially with Hertha Berlin before steering Borussia Mönchengladbach to a stunning 3rd place in 2014-15, far ahead of Klopp’s Dortmund that season. In 2017, at the helm of OGC Nice, Favre took them to an unlikely 3rd, beating Lyon and Marseille to a Champions League spot. Several clubs vied for the Swiss coach’s signature, but Dortmund would ultimately nab him for the start of this season. Perhaps, after the despondency of last season, some Dortmund fans were ready to give Favre time to settle in to his role, and begin to build his own legacy. Favre is making short work of the challenge, meanwhile, sailing to the top of the league with eight wins and three draws in eleven games. The scoresheets have been long, including a 7-0 win over Nurnberg, 4-1 over Leipzig on opening day, and four goals against Leverkusen, Stuttgart and Augsburg respectively. Critics are already describing Favre’s lustrous style of play as ‘modern jazz’ in comparison to Klopp’s ‘heavy-metal’, based on possession and movement and varying tempos. Although Borussia Dortmund are not infallible, this article will highlight just what Favre is getting right so soon. 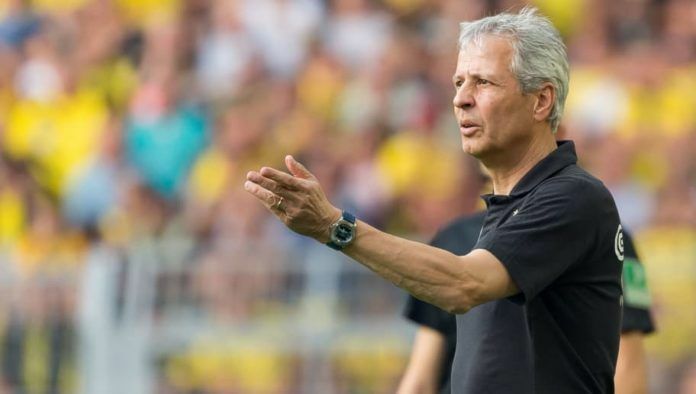 Lucien Favre has inherited a fragment of the Dortmund squad from past years. The team find themselves without a Robert Lewandowski or Pierre-Emerick Aubameyang up front, or the solidity of a Mats Hummels and Roman Weidenfeller at the back. However, a talismanic Marco Reus still shines brightly for his side, whilst prodigal son ‘Super Mario’ Götze has since returned to the fold. Familiar faces such as Shinji Kagawa and Łukasz Piszczeck also remain. Reus, for one, will be more than happy to play for Favre: ‘He is a sensational coach (…) the person from whom I’ve learned the most in my career,’ he said about Favre in 2012 after leaving Gladbach for Klopp’s BVB. It was Favre who brought on Reus in Mönchengladbach, and this hints at what fans have already witnessed in Favre’s first few weeks: faith in youth. Favre is chiefly known for his favouring of younger players, and his career has seen a high amount of confidence placed in young players, including Reus and Christoph Kramer at Gladbach, and Malang Sarr and Wylan Cyprien in Nice. Favre’s faith in youth harmonises with the wealth of young talent at Dortmund, with Jadon Sancho, Jacob Bruun Larsen and Dan-Axel Zagadou assuming prominent roles immediately. Not quite scything through Dortmund’s well-stocked squad, Favre has overseen the sale of several ageing figures: Andriy Yarmolenko and Gonzalo Castro were both sold after disappointing spells, whilst fan favourites Nuri Sahin and Sokratis also left. Favre has since brought in a tactic medley of players, nabbing Abdou Diallo from Mainz, rescuing Axel Witsel from the Chinese Super League, and collecting loanees Achraf Hakimi and Paco Alcácer from Real Madrid and Barcelona respectively. Whilst the team have recently been beset by injuries, including seasoned centre-half Toprak and full-back Marcel Schmelzer, Favre has thrived by making-do. Roman Bürki is the first-choice keeper, whilst the back line has changed subtly during the season. Piszczek, now 33, has been starting at right-back, whilst Zagadou, only 19, has been a staple in the centre of defence. Abdou Diallo began the season at left-back but was moved back to the centre in October, although the promising Manuel Akanji looks set to return to the first XI. Achraf Hakimi, a right-back at Real Madrid, has moved to the left with devastating effect so far, as his performance in the 4-0 win over Atleti showed. In midfield, Axel Witsel has started nearly every game, playing in a double pivot alongside Thomas Delaney, Mahmoud Dahoud or, recently against Bayern, Julian Weigl. Witsel has arguably been the lynchpin to Favre’s squad with his performances. Coming off the back of a resurgent World Cup effort with Belgium, Witsel combines physicality and defensive nous with an impeccable passing range. The attack, meanwhile, has been more than impressive, with 48 goals scored in 21 games. Marco Reus began the campaign on the left wing but has since been moved into the centre under Favre. It is a tactic we have seen carried out by managers all over the globe; drop your best creative player in the hole, with licence to move and pass and conduct the attack. Perhaps Favre’s decision is also reliant on the wealth of talent he has on the wings: Christian Pulisic has become a Dortmund hero at only 20, but he has been challenged by Danish Jacob Bruun Larsen, also 20 and having a breakthrough this season, and Jadon Sancho, the 18-year-old star who has recently earned a call-up to England national team. Typically, Bruun Larsen has held down his place on the left, with Sancho and Pulisic alternated on the right. Up front, Maximilian Philipp and Mario Götze start as nominal strikers, acting more false 9s to link up the play; however, Paco Alcácer has been grabbing headlines with his scoring tally, averaging a goal every 29 minutes. 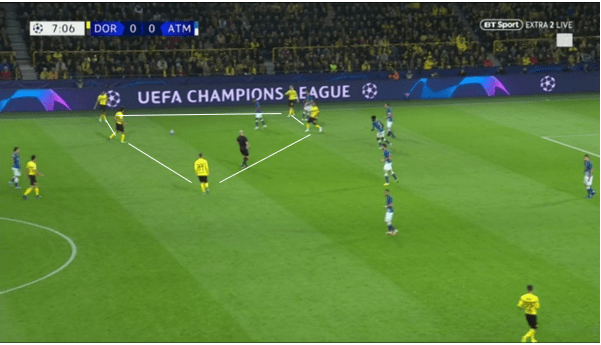 With regards to shape, Dortmund take on the classic 4-2-3-1, a formation which has become a staple of European football this century. Offensively, the shape inevitably changes, with one of the double pivots moving up to help with the attack, the other staying just behind as to mop up any loose balls. Defensively, the shift is reversed, with the attacking midfielder dropping back almost between the double pivot to mark; Marco Reus fulfils this role well due to his tireless work-rate. 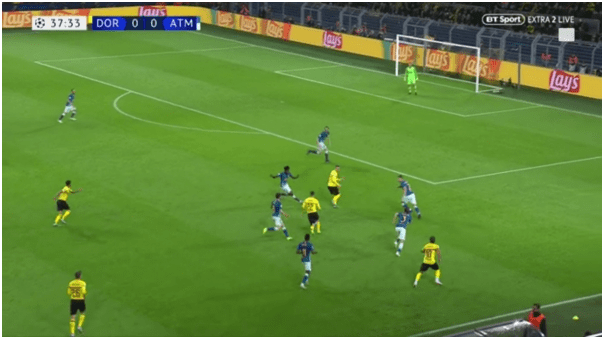 Lewandowski is an archetypal centre-forward, able to evade his marker, as Zagadou and Akanji discovered through his two headed goals; Antoine Griezmann’s goal in the 2-0 away loss to Atletico Madrid similarly exposed a broken back-line. Whether Favre will bring Ömer Toprak back into the starting XI, sign a top defender in January or simply rely on his players becoming more level-headed, remains to be seen. 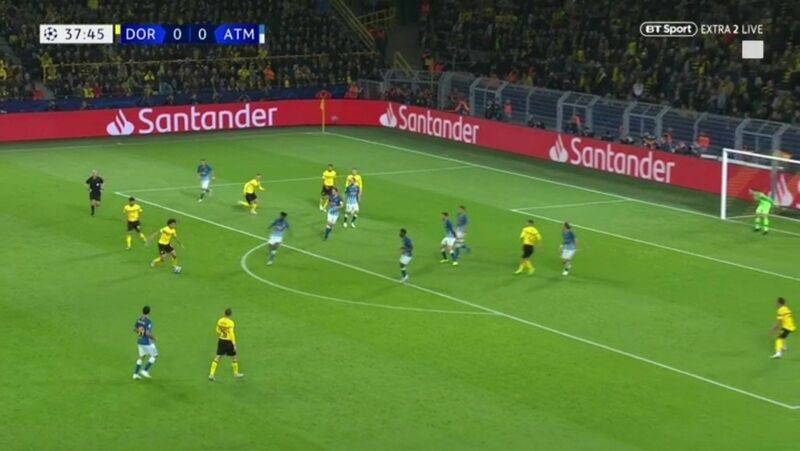 Dortmund looked to draw the Atleti defenders away and disjoint their rigidity, holding the ball up just before the final third, for Bruun Larsen or Reus to sprint into the gap. However, Dortmund are not merely about sideways passing; what makes them so awkward to defend against is their ability to transfer between slow and fast possession, a couple of one-twos leading to a through ball for one of the wingers or the centre-forward to latch on to. The ball dropped back out for Witsel to lash at for Dortmund’s first goal, but this move ultimately highlights how quickly Dortmund transition the ball from wing to wing, lateral passing that seeks to disrupt and stretch the opposition. 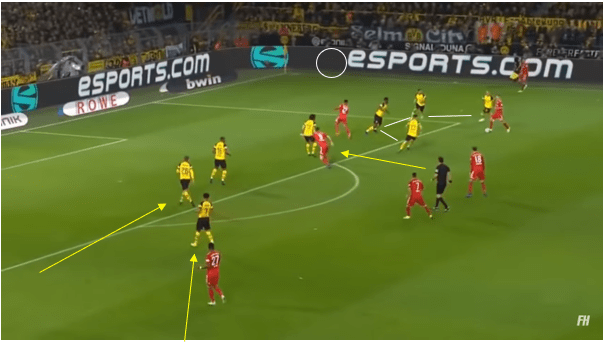 In this regard, Dortmund’s preliminary attack resemble that of Liverpool, with a practical false 9 and the wingers moving into the penalty box. If chances are slim, however, Favre is not afraid to bring on Paco Alcácer; Alcácer might be more the typical centre-forward compared to Götze or Philipp, but he can be selfless in his playmaking, and seems to have an uncanny ability to find space. Combining Paco with Reus has been an effective combination this season, and perhaps Favre will be more inclined to start the Spaniard in more matches. Marco Reus meanwhile has been quietly imperative to the Dortmund side this season, creating and scoring and generally showcasing why he belongs in the top tiers of international football. Scoring the second goal of Dortmund’s 4-0 away win over Stuttgart, it was Reus who initiated the attack from midfield and was present to receive the cutback just outside the six-yard box. The German’s experienced ability and passionate leadership only bolsters Favre’s squad, the touch of magic which so neatly completes it. As The False 9’s Andrew Jaden noted in the Chelsea v Arsenal game this season, the classic cutback or square ball is incredibly difficult to defend against, particularly facing the four attackers of a 4-2-3-1. Dortmund combine pace and positional opportunity for their goals, but there is also an element of selflessness which Favre has clearly installed in his team. Sancho, Alcácer, Reus et al lack the blustering arrogance associated with a missed shot from 25 yards; rather, they look to stretch the defence, to put the ball on to the man in the best position to shoot. As the WhoScored diagram shows, lateral passing in the middle turns to long transverse ball into the box, and then more lateral passes to put the man on. As a result, even with Alcácer’s superb form, 15 different Dortmund players have scored in 21 games. If Favre can uphold this mentality of selflessness (and, as has proved troublesome in recent years at Dortmund, keep hold of his talented youngsters) Dortmund can climb back up to the heights once scaled by Jürgen Klopp. Yet, is a replica of the Klopp model what Borussia Dortmund fans really want? Perhaps, but probably not. Dortmund supporters want to see their team back on top, and Lucien Favre can be the man to guide them there, possessing a young, promising squad, with a flourishing tactical plan that plays to their strengths. Even if Klopp’s heavy metal is still echoing around the Westfalenstadion, Favre’s jazz is the tune we should all be listening out for.